Google is famous for its over-the-top perks, which include special lunches, biweekly chair massages, yoga classes, and even haircuts. Twitter employees enjoy three catered meals per day, on-site acupuncture, and acting improv classes. SAS has a college scholarship program for employee’s children. And plenty of smaller companies have received attention for their unusual benefits, such as vacation expense reimbursement and free books. But what should a business do if it can’t afford Google-sized benefits? You don’t need to break the bank to offer attractive extras. A new survey conducted by my team at Fractl found that, after health insurance, employees place the highest value on benefits that are relatively low-cost to employers, such as flexible hours, more paid vacation time, and work-from-home options. Furthermore, certain benefits can win over some job seekers faced with higher-paying offers that come with fewer additional advantages. As part of a study, 2,000 U.S. workers, ranging in age from 18 to 81, were provided with a list of 17 benefits that asked them how heavily they would weigh the options when deciding between a high-paying job and a lower-paying job with more perks. 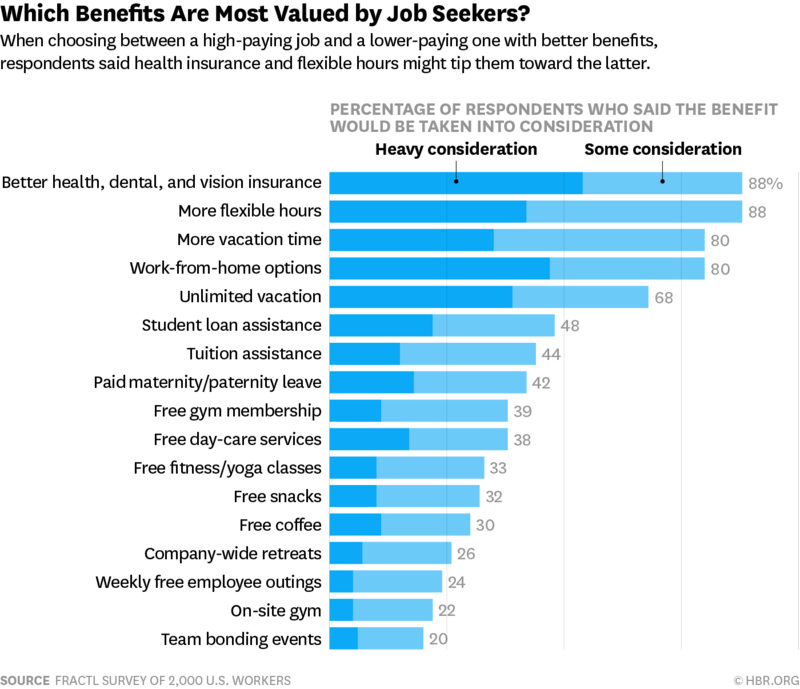 As you can see, health, dental, and vision insurance topped the list, with 88% of respondents saying that they would give this benefit “some consideration” (34%) or “heavy consideration” (54%) when choosing a job. Health insurance is the most expensive benefit to provide, with an average cost of $6,435 per employee for individual coverage, or $18,142 for family coverage. The next most-valued benefits were ones that offer flexibility and improve work-life balance. A majority of respondents reported that flexible hours, more vacation time, more work-from-home options, and unlimited vacation time could help give a lower-paying job an edge over a high-paying job with fewer benefits. Furthermore, flexibility and work-life balance are of utmost importance to a large segment of the workforce: parents. Research suggests that parents value flexible hours and work-life balance above salary and health insurance in a potential job. More vacation time was an appealing perk for 80% of respondents. Paid vacation time is a complicated expense, since it’s not simply the cost of an employee’s salary for the days they are out; liability also plays into the cost. American workers are notoriously bad at using up their vacation time. Every year, Americans leave $224 billion dollars in unused vacation time on the table, which creates a huge liability for employers because they often have to pay out this unused vacation time when employees leave the company. Offering an unlimited time-off policy can be a win-win for employer and employee. Contrary to what employers might expect, unlimited time off doesn’t necessarily equal less productive employees and more time out of the office. A survey from The Creative Group found that only 9% of executives think productivity would decrease significantly if employees used more vacation time. In some cases, under an unlimited time-off policy, employees take the same amount of vacation time. 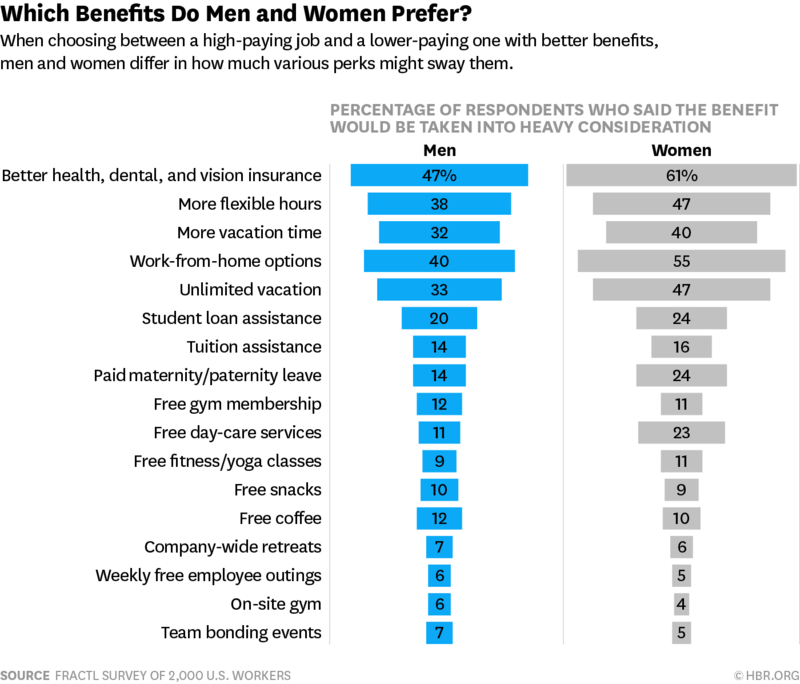 There were gender differences regarding certain benefits. Most notable, women were more likely to prefer family benefits like paid parental leave and free day care services. Parental leave is of high value to female employees: 25% of women said they’d give parental leave heavy consideration when choosing a job (only 14% of men said the same). Men were more likely than women to value team-bonding events, retreats, and free food. Both genders value fitness-related perks, albeit different types. Women are more likely to prefer free fitness and yoga classes, while men are more likely to prefer an on-site gym and free gym memberships. These survey findings suggest that providing the right mix of benefits that are both inexpensive and highly sought after among job seekers can give a competitive edge to businesses that can’t afford high salaries and pricier job perks.